Have you ever had irritable and itchy skin from a sunburn, insect bite or skincare that has irritated you? In most cases, once the inflammation has gone, your skin will get back to normal. But imagine if you had to deal with chronically inflamed, itchy and stinging skin every day? This is the reality for the 1 in 3 Australians who experience eczema. 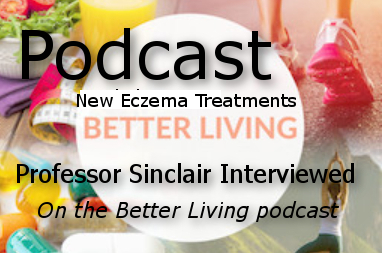 But according to Professor Rodney Sinclair in a recent podcast, the new eczema treatments being developed and trialled have helped even the worst cases of eczema. The long established and effective treatments to treat eczema include cortisone and non-cortisone creams, but there is also evidence that bathing with bleach antiseptic (1/2 cup in one full bath tub) has reduced the presence of eczema. Have you got severe eczema that hasn’t responded to conventional eczema treatments? You can find out more about new eczema treatments and our clinical trials by contacting us here or call the trials team on 0455 915 411.